Camera specifics are Canon EOS Digital Rebel XSi, the fstop: f/9 with ISO at 200, shutter speed is 1/250 sec. This is a photo I shot while I was out on "assignment" to get shots of berry pickers (quotes because I was also after berries). My son, David, and our dog, Grubby, walked out in search of berries. My son is also a wrestler and had gone to a neighboring village for a tournament and they'd sold these hoodies there. We live in a treeless country and our berries grow wild in the tundra. A jaeger was out protecting its nest, came and dive bombed at my son and dog. Grubby enjoyed the idea of "hunting" a bird, he was ready for a fight while the jaeger was set for flight. I submitted this shot for a school project with adjustments to it, here I am submitting without doing any alterations in PS or any other program. 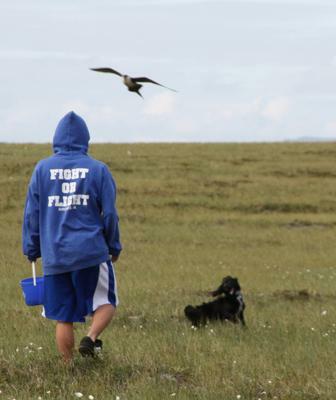 The photo was taken Aug. 2009 in the wide open space of tundra outside of the little town of Nome, Alaska. Thanks for your entry. Unfortunately the photography poses competition closed on the 31st January 2010. We are just waiting for final votes coming in before announcing the winner at the start of March 2010. I really appreciate you taking the time to send your picture to my website and will keep it posted to let everyone enjoy. If you would like to send more pictures or talk to other photographers, I have started a small community on Facebook called the 'World Photography Club'. You are most welcome to join in.